One of the most famous cliff must be ‘The Red Cliff”. It was made famous by Zhuge Liang, Zhou Yu & Cao Cao where the latters army was defeated by Zhuge Liang & Zhou Yu’s combined forces that were grossly under strength. That happened in the Three Kingdom Period. More than Two thousand years later, the next most often mentioned cliff globally must be the “Fiscal Cliff” by Obama’s administration. In additional, tax exemptions and deductions will be reduced while estate duties will be increased. There are more drastic measures taken to save the US from going into recession. While I believe every cents counts, I also believe the main problem needs to be ironed out before measures can be implemented. 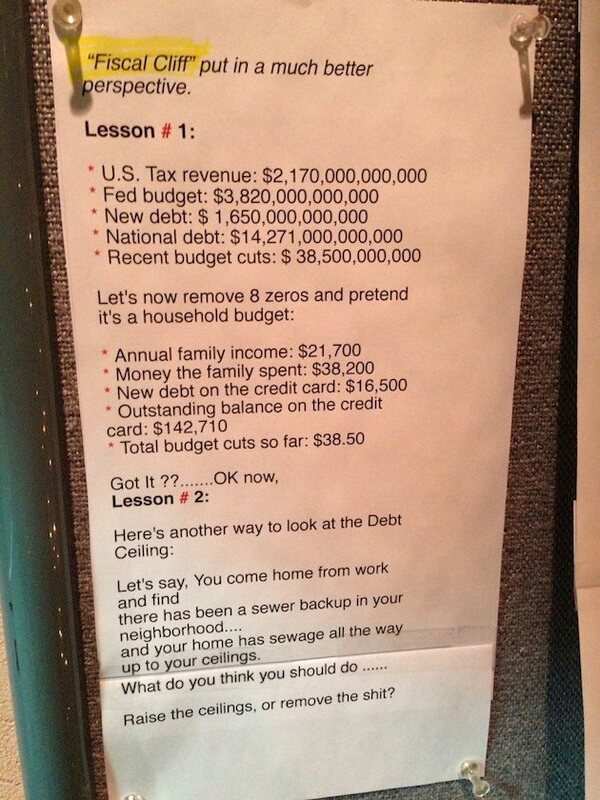 I happen to see a good picture that illustrates my view on the fiscal cliff issue. And here it it to share with you.